Saint Louis Billikens guard Jordan Goodwin. 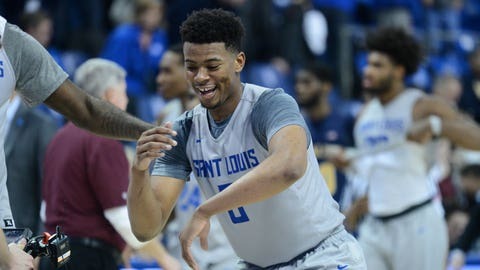 ST. LOUIS – Saint Louis University and FOX Sports Midwest announced today that 10 Billikens men’s basketball games will be carried on the network during the 2018-19 season. The FOX Sports Midwest telecast schedule begins with the Billikens’ season opener against Southeast Missouri State, which is set for Tuesday, Nov. 6, at 7 p.m. at Chaifetz Arena. That game will air on FOX Sports Midwest Plus. The FOX Sports Midwest schedule also includes key nonconference games against Butler at Chaifetz Arena on Dec. 1 and a neutral-site matchup against Florida State on Dec. 22. Two Atlantic 10 matchups are also part of the package. The agreement with FOX Sports Midwest was reached on behalf of SLU by its athletics multimedia rights-holder, Learfield’s Billikens Sports Properties. Games televised on FOX Sports Midwest will also be streamed on the FOX Sports app and at FOXSportsGo.com. The full SLU men’s basketball schedule is available HERE. The Billikens’ robust television schedule includes 26 games that will appear on linear television. The five games not currently slated for television (vs. Pitt, at Southern Illinois, at Fordham, at Duquesne and at St. Bonaventure) are scheduled to be streamed live on either ESPN3 or ESPN+.